Bubali Villa is located 2 minutes from the Eagle Beach. Eagle Beach is recognized as one of the most beautiful beaches in the world! This wonderful 2 story vacation home includes a unique blend of contemporary and classic Caribbean architecture and furnishings with spacious and airy rooms and has the perfect location. The villa is outfitted with all amenities and features 4 spacious bedrooms, all fully air-conditioned and 3 of them have en-suite bathrooms and closets. The masterbedroom has a King Size Bed, 2 bedrooms have Queen Size Beds, and 1 bedroom has a Full Size Bed. The fully equipped kitchen offers you all the amenities and appliances you need. The living area is cool and comfortable with air-conditioning throughout and has a flat screen TV and state of the art audio systems to enjoy. The living room is very spacious and immediately welcomes you with its Caribbean charm and style. The kitchen door leads to a large back patio and offers a pool, a BBQ area and terrace. The total rate includes 15% tax / service charge, including final cleaning, bookings fee and an allowance for water and electricity in the amount of US$ 22, - per night and Wireless Internet. Over usage of utilities, shall be to your discretion and at your expense. Upon arrival, a refundable security deposit is required of US$ 400, -. We brought our family to Aruba for Christmas and stayed at this lovely villa.The house is fantastic with everything you could want in a vacation property. Lots of space for privacy and plenty of family gathering areas, We used the BBQ grill and pool area every day. Must also commend the staff at Aruba Happy Rentals- they are top notch professionals and super nice folks. Would rent again in a heartbeat! Great place and nice host. Air conditioner broke and fixed same day. Delivered a coffee maker when we asked for one. Would recommend this place highly.Thanks to Ingrid and the staff for making our stay great. Very nice house. Staff is friendly and helpful. Air conditioner broke and was fixed same day. Stayed Jan.24 to Feb 3 2018. Beautiful place. The host were very helpfull. Air in bedroom broke down fixed in one day. Delivered a large coffee maker when asked. Thanks to Ingred our host. There is not a tv in every bedroom, but that was not a problem. Would recommend this place highly. Thanks for every thing. Joe and cree. House is great! We had eight people and we all couldn't have been happier. it also Couldn't be in any better location can walk to the super foods which has everything you could ever need and is no more then two minute drive from the main strip where all the good restaurants are. Even though this was my first time staying in aruba I would only stay at the Bubali villa if I came back. Just back from one week here. After years of all-inclusives, this was our first DIY holiday, and we found the perfect venue! 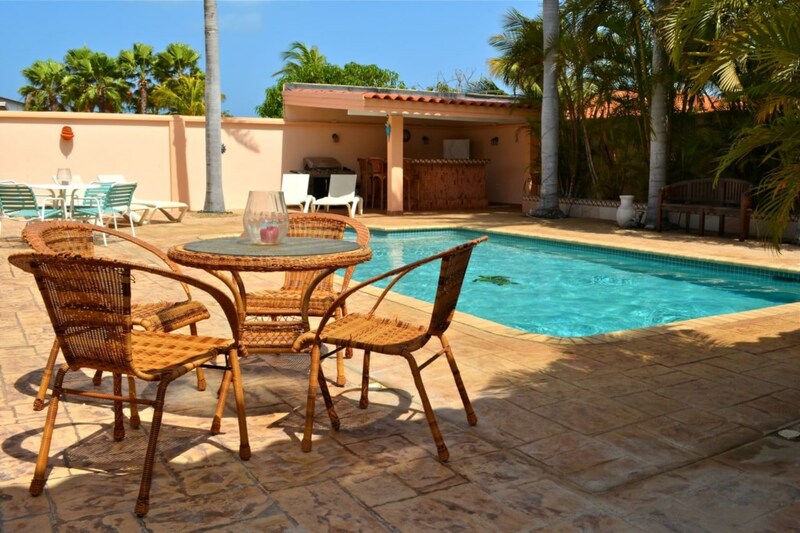 The location of the villa is great with easy access to the main road, close to supermarkets, and only a 5 minute drive to Eagle/Palm Beach area. The outside entertaining area is wonderful with the pool, bar, and multiple seating for lounging. During our stay we had just one small plumbing issue, but nothing serious. The villa was well equipped with beach chairs and beach towels. It was very spacious and easily accommodated our party of 8 people. Loved our vacation to Aruba and look forward to returning again very soon! May I start by saying this property will now be my home away from home!!! I took a Party of 7 women and everyone loved the house. Alyssa and Ingrid were darlings and tended to any questions we had. our flight was delayed but they stayed in touch until we were in the house that evening. I am a travel agent and I am already putting the good word out!!! See you on the return trip!! !